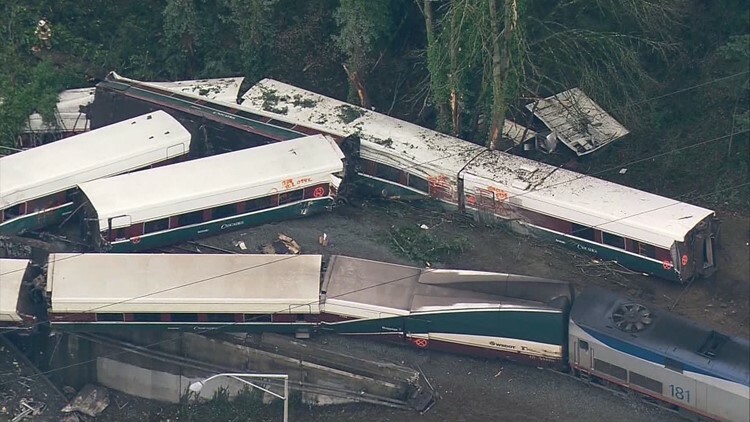 The National Transportation Safety Board is looking into lack and training and oversight in December's deadly Amtrak crash in DuPont, Washington. It was December 18th, 2017. An Amtrak engineer making his first solo trip over a new route had only 60 seconds to orient himself to the controls of a brand new locomotive before pulling his train out of King Street Station. On board were 77 passengers and six railroad employees, for a total of 83 souls. Then as the train was about to cross over I-5 near the town of DuPont, Amtrak train #501 flew off the tracks, hitting a curve at more than twice the speed limit. When everything stopped moving, three passengers were dead and 62 injured. An additional eight people traveling on I-5 were hurt by falling passenger cars and large train parts from the trestle. This Tuesday was the first of a two-day hearing in Washington, D.C. conducted by the National Transportation Safety Board. The NTSB is attempting to find the root cause, or causes, of the accident so it never happens again. The board is also investigating a second fatal crash in Cayce, South Carolina that happened in February 2018. Two members of the train crew were killed and 116 others injured as Amtrak’s Silver Star slammed into a parked freight train. These are just the most recent fatal accidents involving Amtrak, and the NTSB is taking a broad look at passenger rail safety and what can be done to make it safer. On Day 2, the board will hear from experts on how rail safety on American railroads compare to other industries and other nations. Statistically, flying is far safer than taking the train. "We’ve all been there to witness the physics and the devastation and the destruction," says board chairman Robert Sumwalt, citing other Amtrak crashes involving trains entering tight curves at high speeds. Washington’s accident occurred during an inaugural trip over a new route designed to save time by shortening the trip to Portland and bypassing downtown Tacoma, which is often congested with freight train traffic. On paper, it seemed the bypass would have been thoroughly vetted. The new route was considered an upgrade of the existing freight line running along the west side of I-5 and past Joint Base Lewis McChord. Sound Transit owns the line and had oversight over the line’s safety and security. The line received new track and road bed. The speed limit on straighter sections was increased to 79 mph. But the curve at the scene of the wreck at milepost 19.8 wasn’t singled out as particularly risky, other than the posting of speed limits signs lowered to 30 mph. Amtrak #501 hit the curve going 78 miles per hour. "In this case, the curve was problematic," said board member Earl Weener. "Who had the responsibility to point out or determine, or take a first crack at 80 miles per hour into a 30 mile her our curve?" His question was followed by a long silence from a panel of agencies including Sound Transit, Amtrak, the Federal Railroad Administration and the Washington State Department of Transportation, which also helps fund and plan the region’s passenger train travel. "That’s what I was afraid of," said Weener, followed by more silence. "So nobody’s responsible for the mitigation? The potential mitigation of that curve being as problematic as it turned out to be." Finally, WSDOT’s Ronald Pate, director of the agency’s rails, freight and ports division, spoke up, citing the fact that the curve was studied and signed off by an engineering firm which oversaw the upgrade to the line. But crew training, or lack of it, was also a major area for questioning. Amtrak’s Mike DeCataldo noting the federally-owned railroad company is upgrading its training to include at least four orientation trips behind the controls for engineers new to that line. The 55-year-old engineer of train 501 was qualified with just two round trips. Citing interviews with the engineer, NTSB chairman Sumwalt says the engineer was well aware of the curve, but somehow missed the black and yellow warning sign two miles ahead of the curve warning that a slow zone was coming up. As for the sixty seconds in the cab of the brand new Seimen’s Charger Locomotive, Sumwalt asked Amtrak’s representative: "Is that a normal expectation for an Amtrak engineer?" DeCataldo responded: "That is not a normal expectation." Amtrak says while on the first run over new territory, a road foreman of engines would normally be on board, but not this time. The only other person in the cab was a conductor taking an orientation ride and all conversation was focused on operation of the train. Even the lightweight, articulated Talgo train sets came under scrutiny. New rules adopted by the Federal Railroad Administration in 1999 called for tougher passenger car standards for North American passenger operations in the event of a high-speed accident. The European designed cars didn’t qualify, but were grandfathered in after strengthening and other upgrades.